ForeWord Reviews is pleased to announce the 2010 Book of the Year Awards list of finalists. Representing more than 350 publishers, the finalists were selected from 1400 entries in 56 categories. These books are examples of independent publishing at its finest. 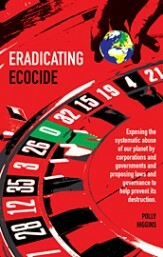 Shepheard-Walwyn is delighted to announce that their book – Eradicating Ecocide – is a finalist for this Award in the Environment category.